We are ready to assist. We, at Global Axellence, believe in customer service "Axellence." 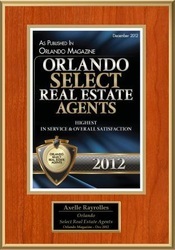 We strive to offer each and every Buyer, Seller or Tenant the best experience and smooth transaction. Since we specialize in foreigners, our team is multicultural and can attend to the needs of customers from all over, understanding the different cultures and business practices. This team of professional ladies can accommodate to most cultures and speak languages ranging from English, Spanish, French, Danish, Swedish, Portuguese, Chinese and much more. 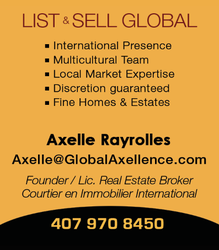 LIST GLOBAL - We specialize in foreign Buyers who acquire Florida properties. 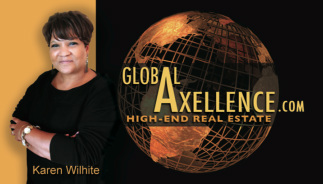 With International experience in the hot Florida Real Estate market and transactions with customers from all over the world, Global Axellence has the skills you need to help you acquire the best property for your money and reach cash buyers overseas. 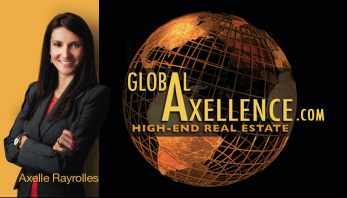 Axelle Gault, Licensed Real Estate Broker and Founder of Global Axellence, is from France and benefits from a bi-cultural background. She followed a European education followed by a Bachelor’s degree in International Affairs/Business from Rollins College, in Winter Park, FL. Axelle serves as the Vice-President of an international non-for-profit called UFE (Union of French Expats: Union des Français de l'Etranger), as well as the Diplomatic Protocol Officer of the Orlando Consular Corps working closely with Consuls of 20+ nations represented in Central Florida. 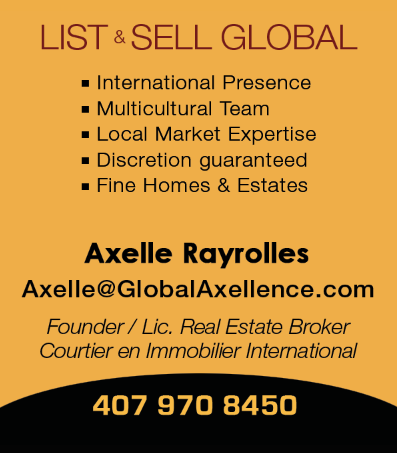 Having lived in both Europe and the USA, she understands and thrives with foreigners coming to invest in Florida. She has successfully handled over 350 transactions with Buyers and Sellers from over 20 countries including North and South America, Europe, Great Britain, Australia & New Zealand, and China. She anticipates covering the globe with a team of professionals, some of which you will discover below. 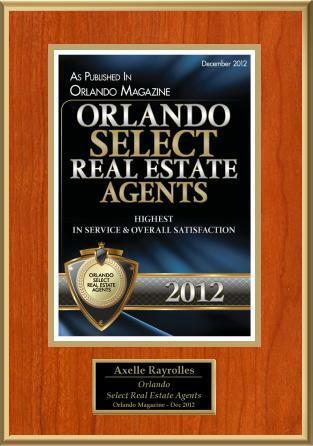 Axelle benefits from numerous contacts with Local and International Residential and Commercial Buyers and Sellers. "We have an extensive list of Mortgage Brokers, Real Estate Attorneys, Title companies, Appraisers, Home Inspectors, Accountants needed in order to take care of you along every step of the way!" Global Axellence represents customers in the sale and/or acquisition of residential, commercial, industrial and income properties including land, restaurants, condominiums, assorted retail establishments, hotels and shopping centers. Our company also manages the sales, re-sales and rentals of single-family homes, town homes and condominiums for key customers and international contacts. facing important real estate decisions, or if you simply need a Portfolio analysis. I will be happy to meet with you and assess your personal situation." ​ Caroline is originally from France where she already practiced Commercial Real Estate on a large scale. She studied in Paris and Fordham University, NY, before moving permanently to Florida in 2007. ​She assists Buyers and Sellers in their transaction from the first contact to the closing table. Her strength lies in her attention to detail and soft-spoken attitude to untangle any complex situation. Leave it to her to find the appropriate solutions and lead you to success. Tom is a local Floridian thriving to accompany Buyers and Sellers to the next property, residential or commercial. He digs deeper and finds the one option fitting your needs along the way to accomplish your mission. As a father, college instructor, corporate trainer, team-builder, realtor, and author, Tom is both energetic and exciting. He writes and teaches from an experiential point of view by "learning through doing", which creates a much larger impact with his audience. Tom is the father of four adult children and lives in Central Florida. Eduardo migrated from Brazil to the United States over 25 years ago; first New York, then Orlando Florida. 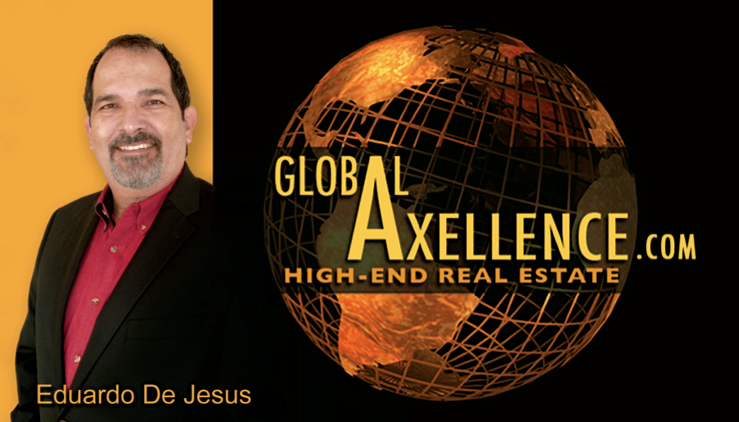 Taking his years of experience in IT and strong customer service background along with his Brazilian roots, Eduardo brings valuable expertise to any buyer or seller. Eager to help his fellow Brazilian customers as well as customers from anywhere else in the world, Eduardo speaks fluent Portuguese and Spanish. Karen is originally from Long Island, New York, where she completed her studies in Business. Her administrative and legal background landed her a position with a major airline company providing exceptional Customer Service. As our Property Management Specialist, with over 7 years experience, she has a complete team of contractors, handymen, and professional companies ready to assist you with any house needs. Her communication skills allows her to be the perfect liaison between an owner and a qualified tenant. Her dedication shows by getting top rent dollar and assures the peace of mind any Landlord desires. Pia was born and raised in Denmark, and has been living in the United States for over 10 years now. She is familiar with the local customs and feels comfortable assisting homeowners and builders in their decoration and remodeling needs in Florida. Once a real estate license holder, her strength lies in her spoken languages including English, Danish, Swedish and French, as well as her eye for staging creativity. 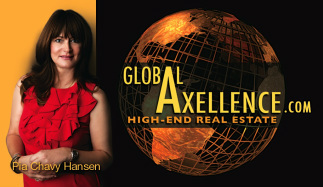 "I would recommend Global Axellence to anyone who is searching for professionalism, creativity, positivity and talent. The team always goes above and beyond her initial assignment. I have rarely met a company with such integrity in all circumstances." - R. Sinni, CEO / The Car Experience - Toronto, CA.